The Overlays are completely reworked and they are now more user-friendly! You can apply any of default templates and customize it according to your preferences. New Overlays are available for both licenses, PRO and ENTERPRISE. 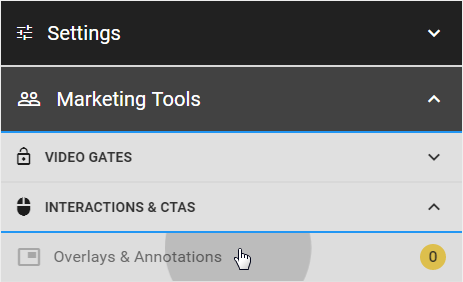 To create interactive overlays go to Marketing Tools, choose INTERACTIONS & CTAS and click on "Overlays & Annotations". Now choose some template which suits your needs. All templates are organized in categories and are also shown below, so you can quickly select the desired one (scroll-down to view all available). When you hover over a template, the tool-tip will show you it's name. Customize the template to match your specific use-case, and that's it! Creating an annotation in the corner of your video, configuring optin lock or just leaving a notification in the desired second of your video has never been easier. The level of possible adjustments is impressive, sky is the limit, literally! You can add animations, set opacity, add your logo or image, change colors of background, links, mouse on hover, add progress bar, etc.